Simply put, your pet can expect relief. As the laser is administered, your pet will relax and enjoy the treatment. The almost immediate relief of pain will allow your pet to be comfortable and any anxiety that your pet initially experiences will dissipate. Occasionally, angry cats will start to purr and canine companions will actually fall asleep during their therapy session. Frequently, after therapy, we hear: “He’s acting like a puppy again” or “She can actually sleep through the night.” Pain relief is provided in just a few minutes of therapy and that alone improves the quality of life for your companion. We provide eye protection for both you and your pet during each treatment. 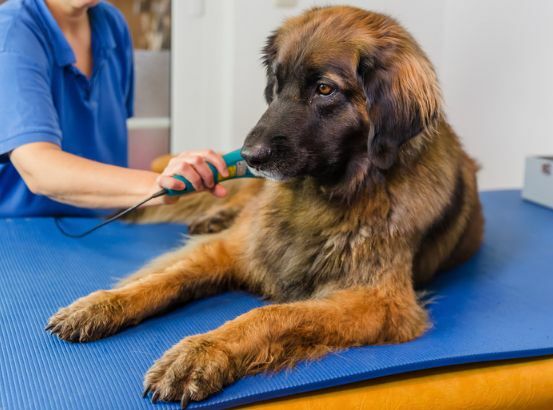 What Are The Signs That My Pet Could Benefit From Companion Laser Therapy? To learn more about how Laser Therapy may be right for your pet, click here or give us a call at (802) 876-7333.